Syrian Refugees Come To Rutland, Vt., But Not Everyone Is Pleased : Parallels The aging town of Rutland opened its doors to Syrian families, but not everyone's happy. "My heart aches for the refugees," says a resident. "But my heart also aches for the locals, our own, first." 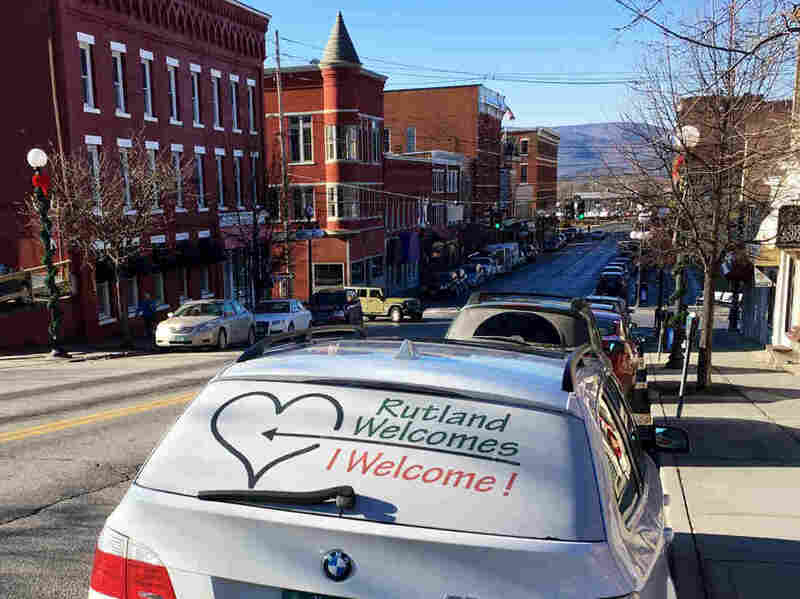 Rutland, Vt., is home to 16,000 residents — including two Syrian refugee families that arrived this month. Last week, the first two of an expected 25 Syrian refugee families arrived in Rutland, Vt., a scenic, blue-collar town of 16,000 people. Now that President Trump is expected to call for a temporary ban on Syrian refugees entering the U.S., these families may never be joined by the 23 others. For some in Rutland, that's welcome news. But others say this rural community desperately needs the youth and diversity refugees would bring. The two Syrian families — four adults and five children — arrived without fanfare, at night. They were exhausted after two days of travel from Turkey. Rutland Mayor Christopher Louras, a champion of refugee resettlement, helped both families move in with host families. The newcomers hope to have their own apartments soon. "As our new neighbors were fleeing for their lives, coming to a new home a half a world away to rebuild those lives, they needed to understand that they were welcome," he said. Speaking through an interpreter this week, members of one family said they felt relieved to be in Vermont. "At first, we came here, and we were surprised by the very, very, warm welcome by the people of Rutland," one Syrian said. "The mayor, our caseworker, our host family, all came and welcomed us, and since then, it never stopped, and people have just welcomed us and helped us in every way." Last year, Louras applied on behalf of Rutland to receive the Syrian refugees, beating out several other Vermont towns to do so. Mayor Chris Louras has worked hard to welcome Syrian refugees to Rutland, Vt. The town beat out several others in Vermont to receive the families. Since then, volunteers in town have been active for months, gathering donations and furniture for the new families, taking free Arabic classes and attending seminars on Middle Eastern history and Syrian culture. The local high school is planning a Syrian dinner to help introduce the refugee families to their new community. Despite all the excitement and goodwill, there remains an uncomfortable divide over bringing Syrians to town. You get a sense of it at the local farmers market, where vendors sell everything from kombucha and winter vegetables to steaming cups of mulled cider. Some in the crowd worry about the vetting process for refugees — is it strong enough? Others are more concerned about the cost of refugee resettlement and how it will affect city and school budgets. Local school officials and the mayor have assured residents that the newcomers won't be a burden or cost local taxpayers more, but many are still not convinced. 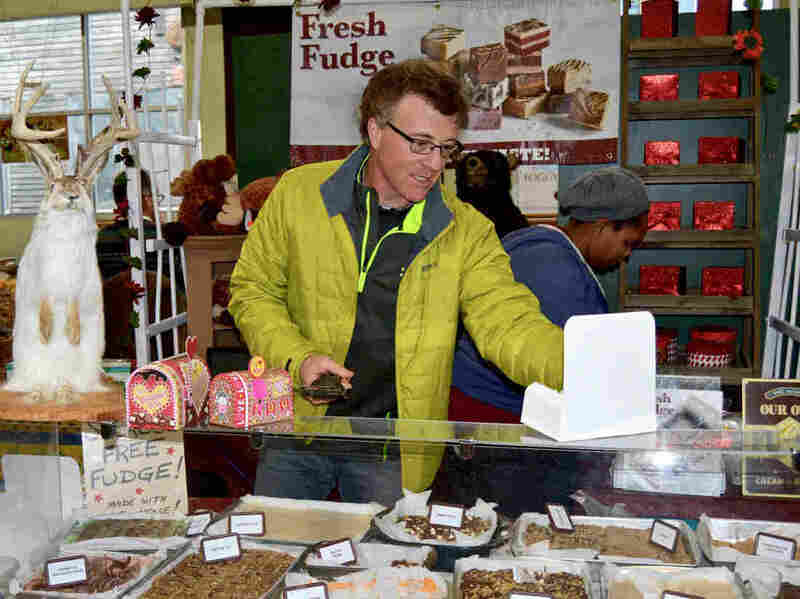 Michael Spafford, 51, took a break from selling fudge to admit he's torn by the issue. "I know the mayor and I know his family," says Spafford. "I know they were from Greece. And my family was from Italy. I get that America is open-arms to all the people from different countries and that we're a melting pot. But what I'm concerned about is, I know people who are living in the woods because they're poor and homeless, and I know veterans who aren't getting proper care." Spafford says he can't forget something President Trump said recently, "that America is giving money out to so many other countries and so many areas. I can't help but think we should be taking care of our own first." Spafford pauses. "I know that comes across as selfish," he says, "and my heart aches for the refugees. But my heart also aches for the locals, our own, first." Refugee proponents — and there are many in Rutland — counter it's not an either-or dilemma. But it's a debate that's been raging for months. Back in April, when Louras announced plans to bring in the refugee families, many were surprised. Rutland has never taken in refugees before. The mayor emphasized that helping Syrians was the right thing to do. But he also believes refugees can help solve a problem: Rutland's shrinking population. 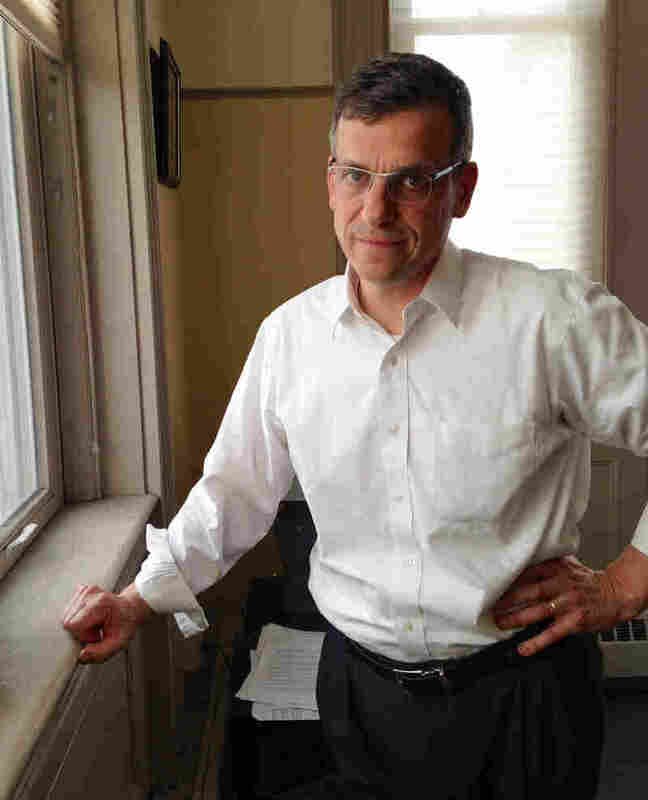 Michael Spafford says he's torn about having Syrian refugees resettled in Rutland, Vt.
Lyle Jepson, executive director of the Rutland Economic Development Corp., says the city's population is expected to decline by 10 percent to 16 percent by 2030. Most of that drop will be among those younger than 50. "What that means is we're entering a crisis period," says Jepson. "We are retiring, we are living much longer and there are fewer people coming in to replace us." Vermont's median age, 42, is the second-highest in the country. Only Maine skews older. A report by the Vermont Chamber Foundation projects that the entire state will need nearly 11,000 new employees every year until 2040 to replace retirees and fill new jobs. "We hear people say our children are leaving because there are no jobs here," Jepson says. "But we need to change that narrative — because there are jobs here." He says young, motivated refugees would be a welcome part of the talent pool in Rutland. The newcomers from Syria include people who are multilingual. One of the refugees holds a degree in French literature. Depending on their skills, Jepson says they might find work with local hotels, nursing homes, the nearby Killington ski resort, the regional hospital or local GE plant. Back at the farmers market, Josh Squire wraps up a sale at his vegetable stand. The 32-year-old farmer moved to Rutland from Delaware, which he describes as much more culturally diverse. Rutland, he says, would benefit from more diversity. "Different ideas can spur a new business, and that new business brings in money for the economy. Those people who are working in that new business can now come to my business and, like, it'll spread. So having even a couple hundred more people in our little town, it's going to make a big difference for us," he says, smiling. But his shoulders sag as he admits that he worries if the U.S. scales back its refugee programs, Rutland's first two Syrian families could be the last.